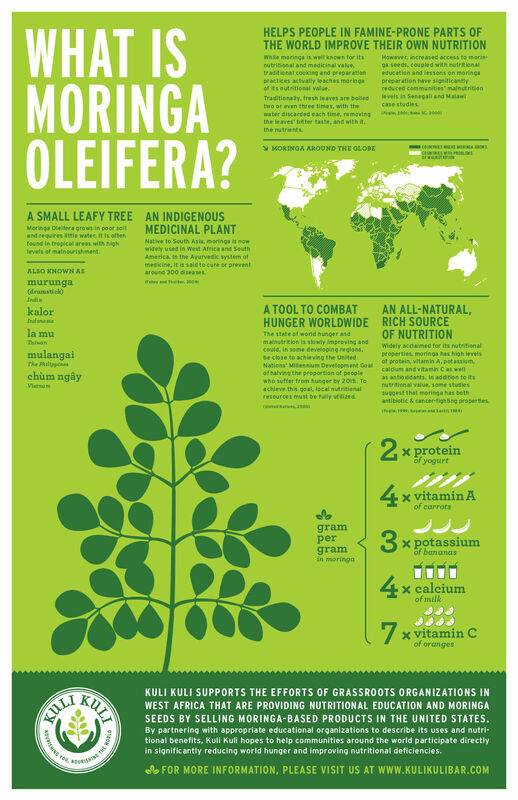 Moringa oleifera is a quick-growing tree in South Asia and throughout the tropics. The Ayurvedic system of medicine uses its leaves to prevent and cure more than 300 diseases (1). In fact, it’s been used as medicine (and food) for over 4000 years (2)! Moringa has been nicknamed “drumstick tree”, “miracle tree” and “horseradish tree”. It’s characterized by small, round leaves that are loaded with nutrients. It’s also full of fiber, which helps clean up your intestines and maintain digestive health. Best of all, the leaves contain isothiocyanates, an antibacterial compound that helps your body fight H. pylori – the bacteria responsible for gastritis, ulcers, and gastric cancer (3, 4). It’s so powerful that even: “the modern scientific community has begun to validate many of these claims with over 1300 studies.”(5). 2x the protein found in yogurt. 4x the vitamin A found in carrots. 3x the potassium found in bananas. 4x the calcium found in milk. 7x the vitamin C found in orange. These leaves are loaded with antioxidants such as beta-carotene, vitamin C, chlorogenic acid, and quercetin (6). Cholorogenic acid helps slow down the absorption rate of sugar in cells (7). According to one study, women who took 7g of the powdered leaf daily for 3 months reduced their blood sugar levels by up to 13.5% (8). 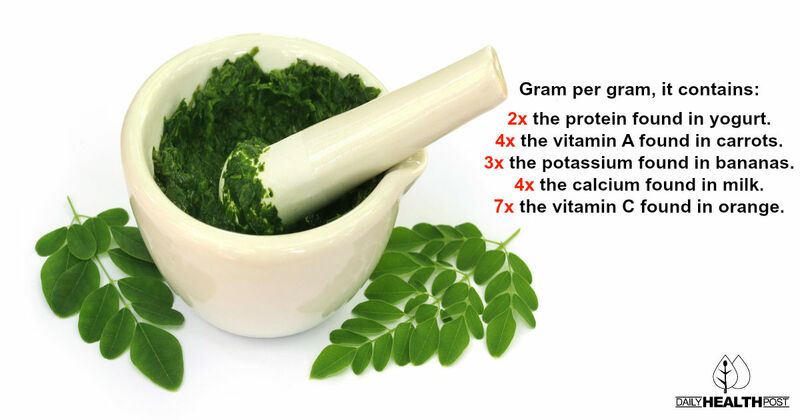 Moringa leaves contain an anti-tumor and anti-cancer compound called niaziminin (9). Currently, India is the largest grower of Moringa as the plant is native to the region. The tree has long been claimed to contribute to the low pancreatic cancer mortality rate in India, which is among the world’s lowest (10). 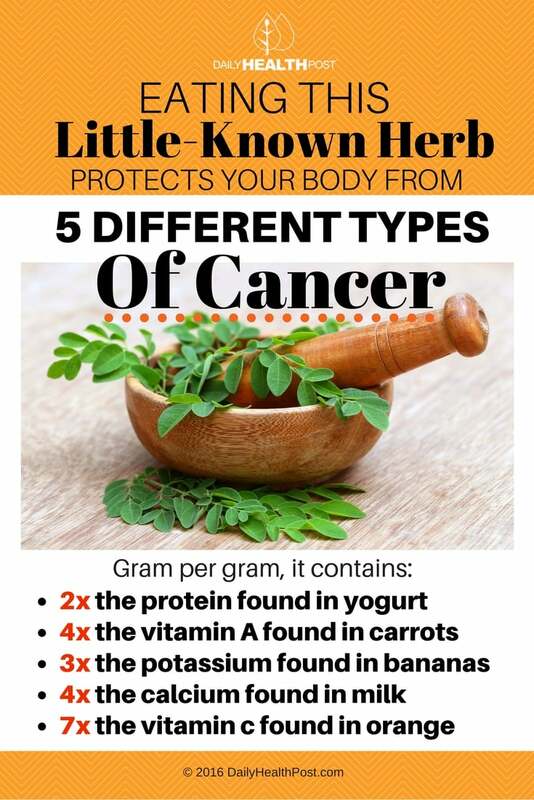 A recent study found that moringa “greatly induced apoptosis, inhibited tumor cell growth, and lowered the level of internal reactive oxygen species (ROS) in human lung cancer cells as well as other several types of cancer cells, suggesting that the treatment of cancer cells with MOL [M. oleifera leaves] significantly reduced cancer cell proliferation and invasion.” (11). So there you have it, Moringa has anti-cancer properties capable of fighting and/or preventing pancreatic, gastric, colorectal and breast cancer.